According to statistics from A Recycling Revolution, American’s throw out enough glass bottles on a monthly basis to fill a towering skyscraper. You may be wondering what you can do to keep your bottles and jars out of the landfill. Well, you have options. 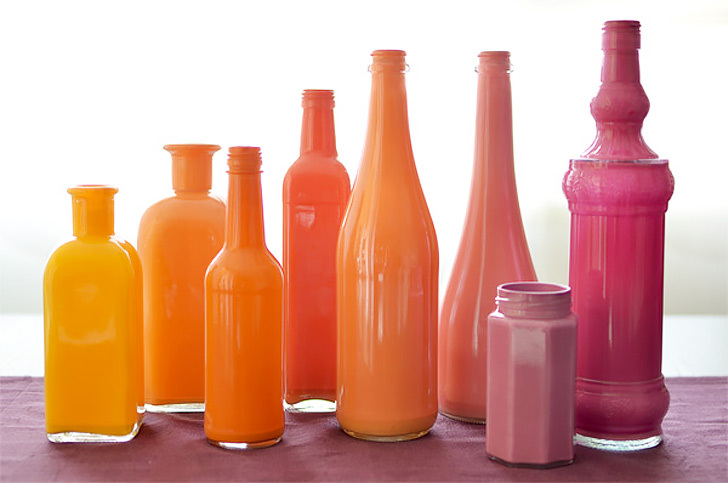 Rock Bottom Bottles said, “You can recycle your glass products, or, even better, you can reuse them in some nifty crafts.” Try these eight great options for using your glass bottles as low-cost decorations and other useful items for around your home. Yes, you can use your glass bottles to water your plants. Pick bottles of the size best suited to your planter. A wine bottle would be perfect for a larger planter, but your little indoor pots might need something smaller. Then, simply fill them to the brim with water, and quickly shove the bottle neck down into the dirt. We recommend doing this somewhere that spillage won’t be an issue because you just might get water everywhere the first time. If you want to make it look pretty, try these instructions from Instructables for etching a pattern on your bottle before use. Regardless of the size of your bottles, they can be made into handy citronella candles to keep bugs away from your outdoor entertaining spaces. You’ll need wicks, citronella fuel, and some simple pieces of hardware for this quick craft. You can sit them around your outdoor areas, or invest in some additional hardware so you can mount them. The best part is they look much prettier than tiki torches and are totally refillable. Plus, no bugs! Read the full instructions at Hello Glow. This works best with completely clear glass bottles, but you can use the colored ones as well if they are a lighter color. You can use a spray paint (just make sure it works on glass) to coat the outside, or a liquid paint to coat the inside. Just pick the perfect array of colors to compliment your décor. Experiment with designs by using tape or rubber bands to block off sections. Or play with texture by using glue to create a design and then painting over it. Image from Handimania. This one is just gorgeous. You cut the bottom off of wine bottles and then set them over your candles to create a beautiful display. They are perfect for everything from a wedding to a romantic dinner, and would even look great out on the deck. Check out this detailed list from Emmaline Bride. Fill some of your empty wine bottles with Christmas lights and enjoy the festive accent they add to any room. They add a soft glow and look really neat. You can even use them as a nightlight. You’ll definitely want to display these year round after following these simple instructions from Taste of Home. Need a way to organize your bracelets? Most of the smaller glass bottles (like beer bottles) are the perfect size for storing bracelets. Just drop your bracelets around the bottle and you’ll soon have a stacked display that makes it easy to see your accessories. Leave it out on your dresser for a pretty decorative accent. Image from Decoratrix. Reuse your glass bottles as bird feeders, and you’ll help both the landfills and the neighborhood wildlife. Pick up some bird seed, a thrift store plate, and a few simple materials, and you’re ready to go. You’re sure to attract some beautiful birds to your yard with this craft. Watch this video from the Upcycled Stuff YouTube channel for the step-by-step. Not satisfied with the look of your bottle of dish soap? Use a bottle to replace it. You can go with a plane, label-free bottle or etch, paint, or wrap the bottle for a more custom look. Then fill with your favorite dish soap and top with a bottle pourer. You can use the same technique for hand soap too. Check out the full instructions on Living Well Spending Less. How to Generate Cash in a Short Time Frame.